Don’t get stressed over freezer cooking! Make everything from prep to storage to dinner time easier with these freezer cooking tips. Freezer cooking is supposed to make your life easier, but some people find it super stressful to get started doing them. It seems so overwhelming, but it doesn’t have to be. Throughout years of making them, I’ve found a few freezer cooking tips and tricks to make freezer cooking just a bit easier. 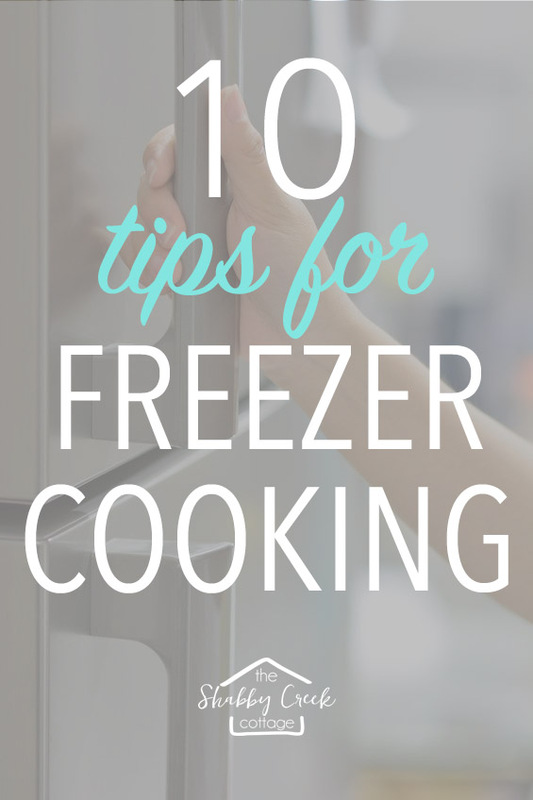 Don’t do more than 10 freezer meals if it’s your first time. You should easily be able to make ten meals in under two hours. Once you have those done, then a week or two later, do another batch. Want to go even easier? Next time you make soup, then double your batch. Completely cool it, then put it in the freezer and you’ve got a crazy simple meal later on. If you do this every day for a month, you’d have a stash in no time! If you want to go all in, my freezer meal plan will walk you all through it step by step! Shop the day before. If you’re going to make a huge batch of meals at once, then shop the day before so you can wake up and get started as soon as you can. It will be much less stressful if you don’t feel like you’re running out of time at the end of the day. Use a food processor to mass chop vegetables. One of the most common ingredients in my meals is typically onions. I use them in everything! So when I’m doing freezer meals, I chop up 4 onions in under a minute. That doesn’t seem like much help, until you factor in doing other veggies, too. Assembly line as much as possible. Do the math and make sure you know which meals need which ingredients and mass produce things like rice, or cutting up meat. If you need it at least twice, chop it all at once. Bag holders can give you an extra hand. Food storage bags are perfect for freezer cooking because you can freeze them flat and stand them up once frozen to organize easier. 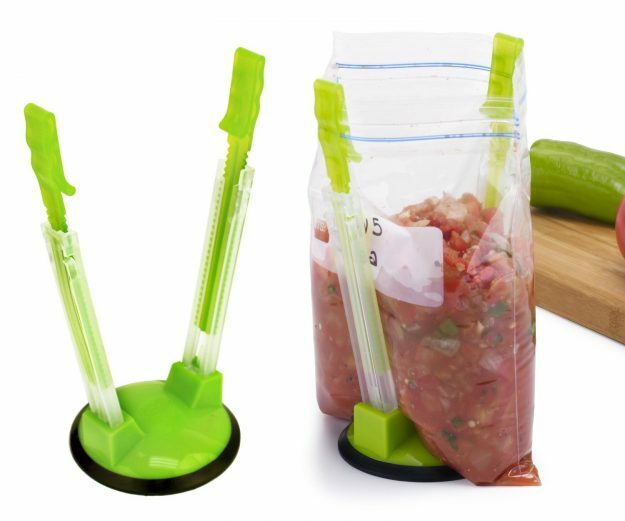 Bag holders can make getting the food into those bags much easier. Make sure to mark EVERYTHING. Either with a marker or on freezer labels, make sure that you mark what the meal is, when it was made, and how to cook it. Eat the oldest meals first. Meals typically keep 3-6 months, so be sure that you’re eating them before that. If you don’t, then not only have you wasted money on food, you wasted your time and energy to make them. Thaw your meals overnight in the refrigerator. While you don’t *have* to do this, if you do then it will cut down significantly on cooking time. Never, never, ever thaw them at room temp – that is a recipe for bacteria. Not good. If you have to cook them from frozen, just add more time. Cover the meal for the first half of the cooking time with aluminum foil to prevent the top from browning too much. Share a meal with someone else. While this might not help your family directly, next time you want to give someone a gift of food (maybe when someone has a death in the family), then pull out a meal. The instructions are right on the container (because you did that, right?!?) They can either cook it right away or put it up for a few days later if it’s easier for them. My pleasure Norma, it is a real time saver for sure!